When I was a kid, my sister and I frequented a little stream in the woods about a quarter mile from our house. We snuck along the side of a neighbor’s house, through overgrown thickets of blackberry brambles and along a long-neglected utility road to a tall, shady stand of trees and fallen logs and big boulders. 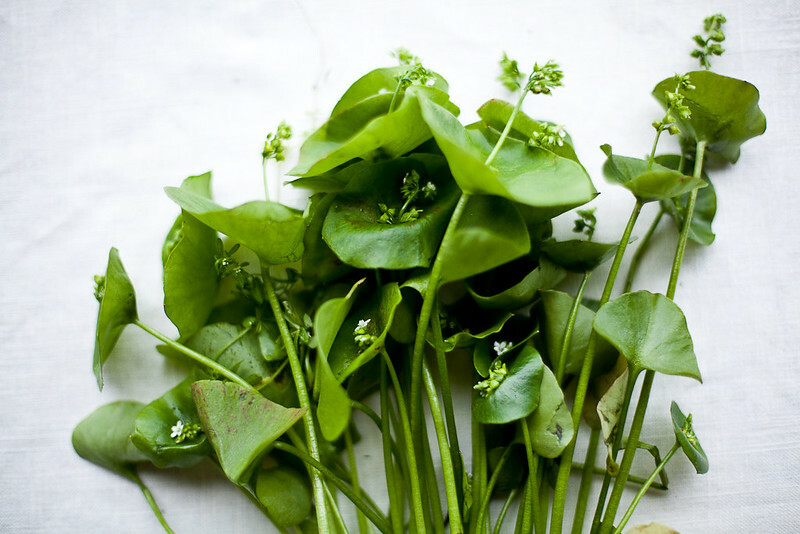 Miner’s lettuce is a shade-loving plant and it was everywhere. The name is so evocative, and its relationship to California’s Gold Rush history, even if exaggerated, made me feel like I could be a totally self-sufficient forest dweller if need be. We would catch newts and pretend to grill them. (Apparently, they’re poisonous. Good thing we never actually ate them. And so much for self-sufficiency.) We had a series of plywood planks and old wood boards criss-crossing a huge grove of hollowed out redwoods: that was where we would live, in our forest dweller fantasy. I’m so happy that I got a little bit of a carefree childhood like that, that I could wander into the woods and play with my sister and fall off rocks and make a big mess in a stream and survive all of it. Because I think most of us survived those less-tethered, occasionally unsupervised childhoods. And our unsupervised adventures to the stream are among my absolute favorite memories. This year on Easter Sunday, I went on a rainy day photo walk with some friends in the Presidio. It was nice to be out earlyish, and on such a quiet morning, and with such dramatic weather. I love spring storms and glorious grey light. It makes me happy. 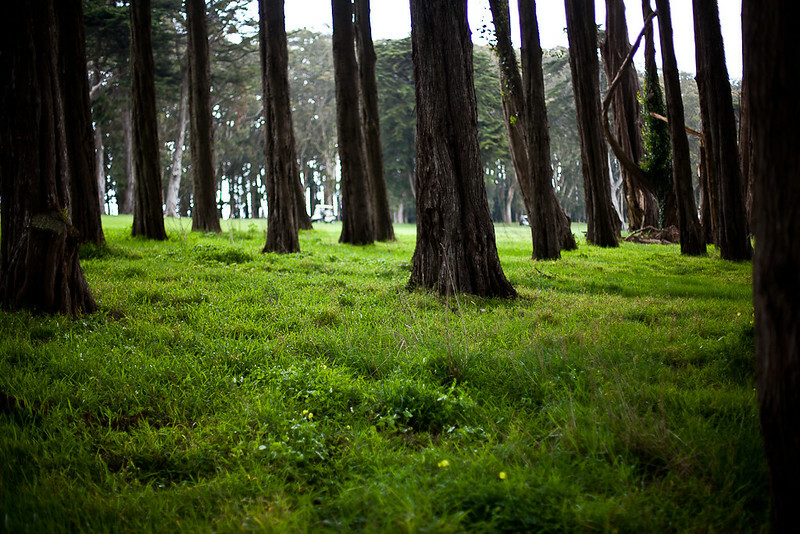 Also making me happy: that I discovered a huge grove of miner’s lettuce in the urbane wilds of the Presidio. It brought me right back to those days of childhood survivalist fantasies. It’s among the most easily identifiable of plants to forage, owing to its unique round lettuce leaf with the little white flower in the middle. The flavor is mild, sort of spinach-y, with a pleasant sturdiness to the leaf despite its delicate appearance. Just make sure you positively identify it before munching on them! First, make the dressing. Whisk together the olive oil, white Balsamic vinegar, grain mustard and shallots vigorously. (If using a more acidic vinegar instead of white Balsamic, consider reducing vinegar. Adjust to taste.) Set aside. For the soft eggs, bring a small pot of water to a gentle simmer. Once simmering, carefully lower eggs into water with a slotted spoon. Keep at a low simmer, and set a timer for 7 minutes. While the eggs simmer, warm a skillet over medium heat. Add a small amount of olive oil and the asparagus slices. Saute until just tender, about three minutes. Remove the eggs from heat. Let them sit in a pot of cold water until ready. Combine the miner’s lettuce with the asparagus. Toss with the dressing. Top each salad with egg halves. Aurora Satler - What stunning photography, you are making me homesick for the West Coast! I love your site and will be vigilant for some miner’s lettuce when I have a chance to get out of NYC and back into nature. 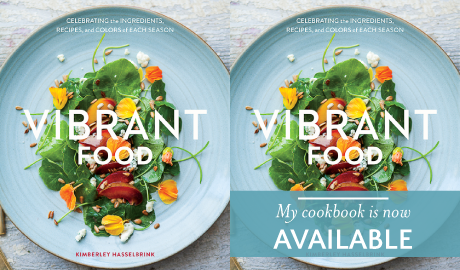 Congratulations on becoming a Saveur finalist! Irina @ wandercrush - Ah foraging is such a beautiful thing, I’m consciously trying to incorporate it more and more into my cooking process. Kiran @ KiranTarun.com - Yummy and perfect spring deliciousness!! Magda - In Greece, this time of year, we always go foraging for wild asparagus. Food tastes differently when you gather it from the ground yourself doesn’t it? I love your salad, Kimberley. It looks so inviting. Laura - Congratulations Kimberley! Your blog has been a serious fave of mine over time, so it’s always awesome to see that recognition. Eff yes! tara - Now this will sound strange, but I love the wet greeness of these photos. It’s just beautiful. 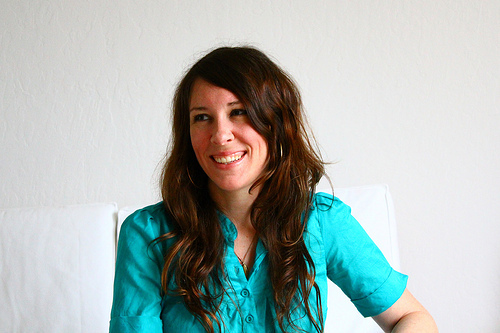 Sam - So thrilled to see you a finalist in the Saveur awards, Congratulations. I have cast my vote. amelia - yayyyyy! And with that Lottie and Doof fella out of the picture, you’ve got the title this year for sure!! Puja @ Indiaphile.info - Oh Wow! I love to forage! Miner’s Lettuce sounds delicious. I’m going to look for it. 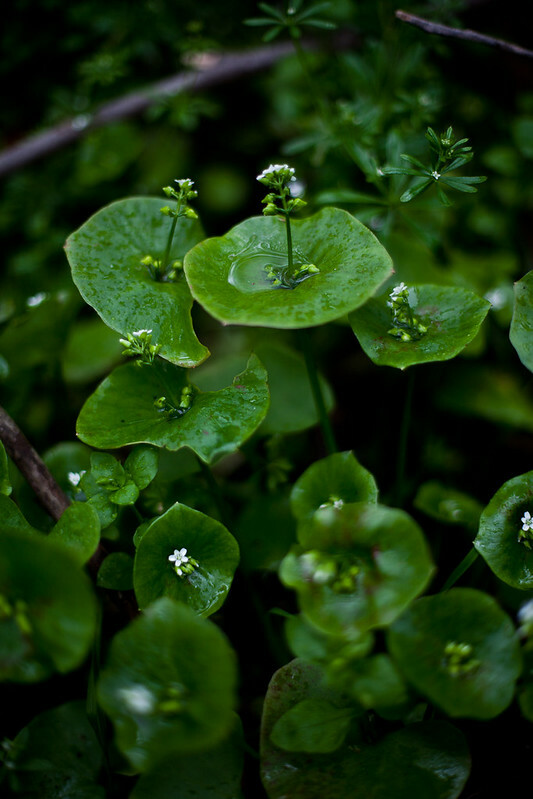 Rita - Your photos of the miner’s lettuce are wonderful!